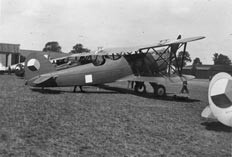 Aero succeeded in winning the Czechoslovakia Ministry of National Defence bid for a recce and bomber plane in 1932, this type was again a biplane. By early 1930s company was making A100 two-seat multipurpose aircraft and A102 fighter. The wings were wood-framed, covered by fabric, and fuselage, elevator, rudder as well as tail-plane and fin steel-tube-framed, fabric-covered.